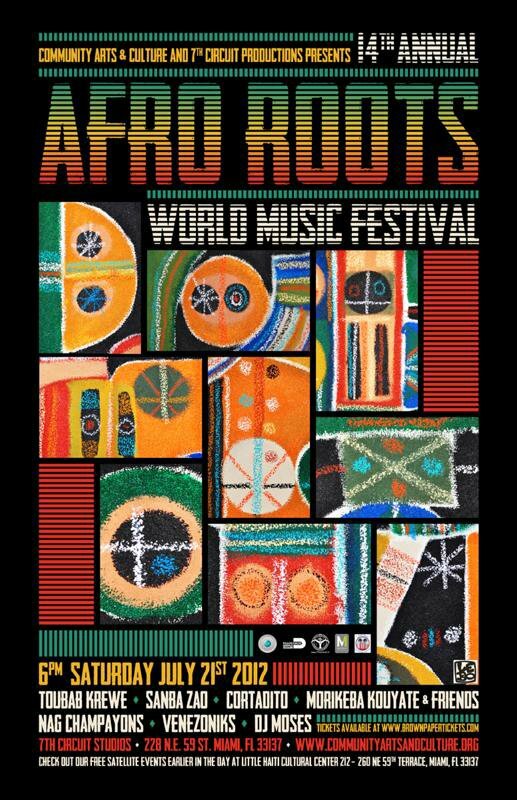 Miami, FL – Community Arts and Culture presents the 14th Annual Afro Roots World Music Festival, Celebrating 14 years of serving Miami Dade County with quality programs. The festival has been able to expand its reach beyond local South Florida artists by bringing in performers from African countries such as Senegal, Ivory Coast, Guinea, Mali, and the Republic of Congo. This global connection through music has helped the festival evolve into one of Miami’s most culturally diverse events. The 14th Annual Afro Roots World Music Festival will take place on July 21 at 7th Circuit Studios located at 228 NE 59 St., Miami, FL 33137. The evening will feature an array of percussion driving acts like the Afro-Venezuelan electronica group Venezoniks, spearheaded by Elastic Bond keyboardist/producer Andres Ponce, Haitian Racine legend Sanba Zao and West African Senegalese Kora master and griot from Senegal, Morikeba Kouyate. The night will also feature a new Cuban Son duo called Cortadito, the Afrogalactic Tropidelic sounds of Jam band Nag Champayons, and headliner Toubab Krewe; a band that mixes Malian with Southern American musical styles and is currently signed with the National Geographic label NATGEO. The festival has added two free satellite events taking place at the Little Haiti Cultural Center located at 212-260 NE 59th Terrace Miami, FL 33137. The two events will be our kids program Let the Children have Music and Dance on Saturday July 21, 2012 from 10am -12pm. The theme of the show will be Voices of Africa, and will feature Morikeba Kouyate showcasing the Kora (African Harp), Ibrahima Dioubate showcasing the Balifon (African Marimba). Following the kids program will be a panel/workshop titled Voices of Africa, and will deal with the influence of African Music and culture past, present, and future. Panelist will include African Kora master Morikeba Kouyate, Haitian Racine legend Sanba Zao, festival producer Jose Elias, and more tba. Sponsored by the Miami-Dade County Department of Cultural Affairs, WDNA, 7th Circuit Productions, and the Little Haiti Cultural Center.